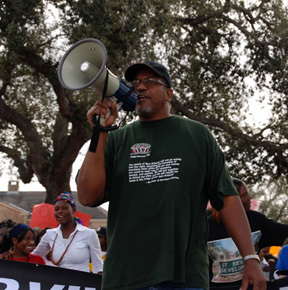 WTUL News and Views Interviews Malcolm Suber of Communities United for Change about recent organizing in support of Federal Investigations into NOPD, as well as the ongoing struggle with NOPD in poor communities of New Orleans. On the table are recent federal investigations into NOPD killings; cultural disfunction within the NOPD; a brief history of white supremacy in the police force from reconstruction times; and objections to Serpas' role as a third-generation NOPD officer destined to continue the disfunctional legacy. Also discussed are citizen oversight of the many federal investigations into NOPD, the recent egregious behavior of the 6th distict police in Central City, and the general failure of the criminal justice system for the poor.